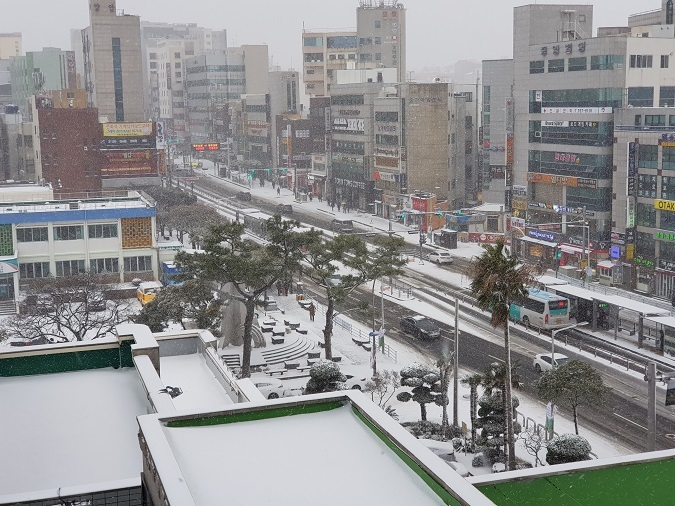 As Jeju sees its heaviest snowfall of the year, residents and visitors to the island will have woken up this morning (Jan. 11) to see snow covering the ground. The amount of snowfall seen overnight (by 4 a.m.) varied throughout the island, although pretty much everywhere was affected. Jeju City saw around 1cm of snow, Seogwipo 5.2cm, and Aradong 6cm. Further up Mt. Hallasan, the Eorimeok trail saw a massive 32.6cm of snowfall. This snow has caused its own fair share of problems. The 1100 and 5.16 roads over Mt. Hallasan have been made off limits, while many other roads have seen traffic slow down significantly. One of the most affected places has been Jeju Airport. After significant delays last night, the airport was completely closed this morning as workers tried to clear the runway of snow. However, this is proving to be a difficult task as snow continues to fall. In fact, while the snowfall will slow down later in the day, it is expected to return again and by tomorrow morning there is expected to be another 3-8cm of snowfall in the city and 10-30cm of snow on the mountain areas. For those who are getting sick of the cold, though, there is some good news ahead. This is because the Korea Meteorological Agency is currently anticipating that the temperature could once again reach double figures by as soon as Sunday and even reach a fairly impressive 16 degrees by Tuesday!